I'm not really all that into gadgets and things and stuff. I didn't get a cell phone until just a few years ago, and I've only ever owned a single mp3 player and a single digital camera in my life. Occasionally I'll become fixated on a particular thing and imagine that having it would make me a little bit happier, but even then its really more a matter of trying out, just for fun, the idea that some thing would make my life 25% better than actually believing it. Still, there are a few things I own that I enjoy owning because they're designed well, and when I use them they work well. Like my Chrysler 300, my iPod, my Salomon hiking boots. 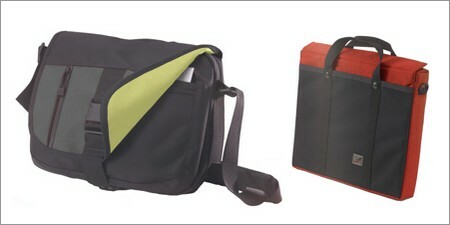 I think my new Tom Bihn laptop bag is going to be one of those things. I've been envious of Lori's Tom Bihn bag for a while (she's had it for 15 years), and she kept telling me how nice the company was, and then they had colors I liked so I got one. And after a few days I really like it. It has lots of pockets and the strap is very comfortable and it feels great. It seems well put together and has some nice features, and the company really does seem respectable. Also, Tom Bihn is probably one of the few laptop bag manufacturers who has a Snopes page.